Handmade by an artisan, this is produced with French brandy and three varieties of cherries: Chalonnaise, Merises and Marasques. They are harvested in Burgundy and Italy and then slowly macerated with premium French brandy and cloves, black vanilla, almond and orange zest. 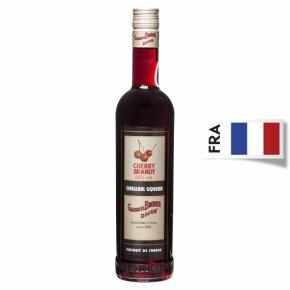 This Cherry brandy is made of a blend of sour black cherries of different varieties and origins with a very high quality grape spirit carefully selected by Gabriel Boudier. The result is much finer example than you will find elsewhere with the aroma and taste of true ripe cherries.